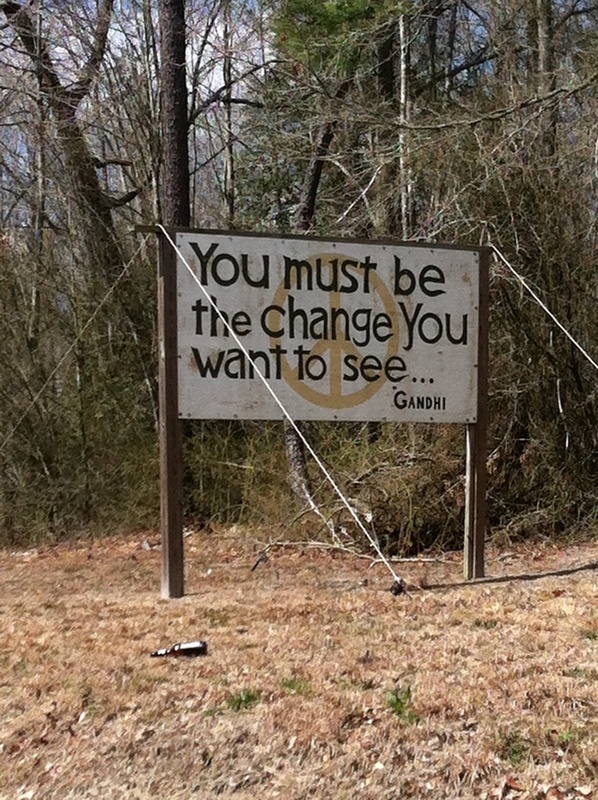 On Easter, and on the eve of the end of Passover, we ponder Gandhi’s words, painted on a weathered board in southern Delaware. Our overnight host in NJ, Lorenzo, told Jeffrey he thinks Easter and Passover are about the same thing. He has a point. The common thread is liberation: from death (Easter) and from slavery (Passover). Liberation is good. Hope your day was meaningful. Jeffrey spent a pleasant night with his old friends. 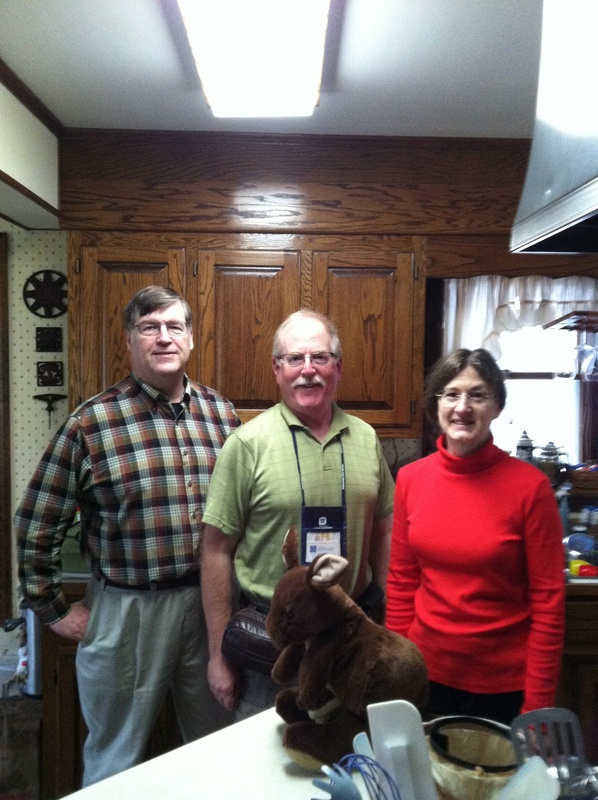 Doug and Nancy joined us for a photo. Then the humans breakfasted on matzah brei (D&N supplied the eggs, Jeffrey brought the matzah) and NY maple syrup. Nancy and Doug each tried out the trike. Then we hit the road. An Easter services traffic jam delayed our entrance onto the highway. There, we were slowed by the washboard surface (for those who don’t know what a washboard is/was, think of rolling over miles of sixpack abs) and steady rain. 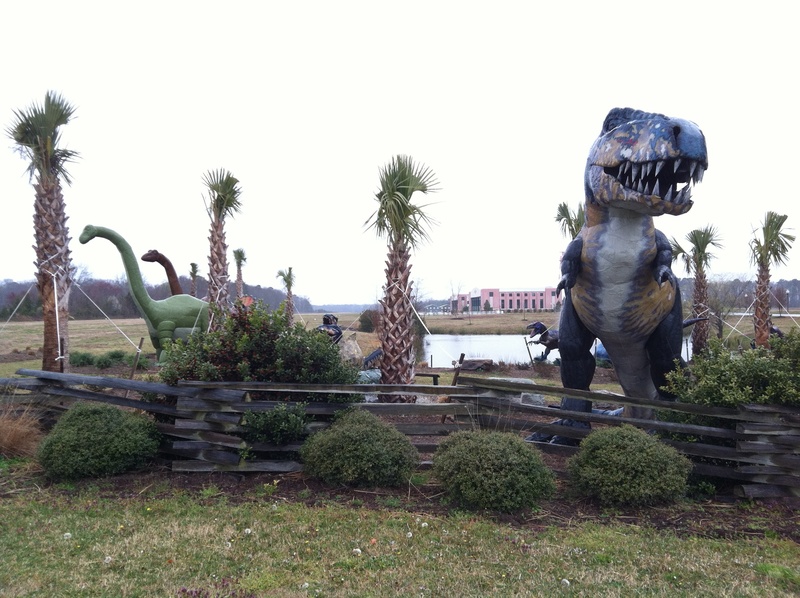 The Virginia Beach airport is behind the dinosaurs. 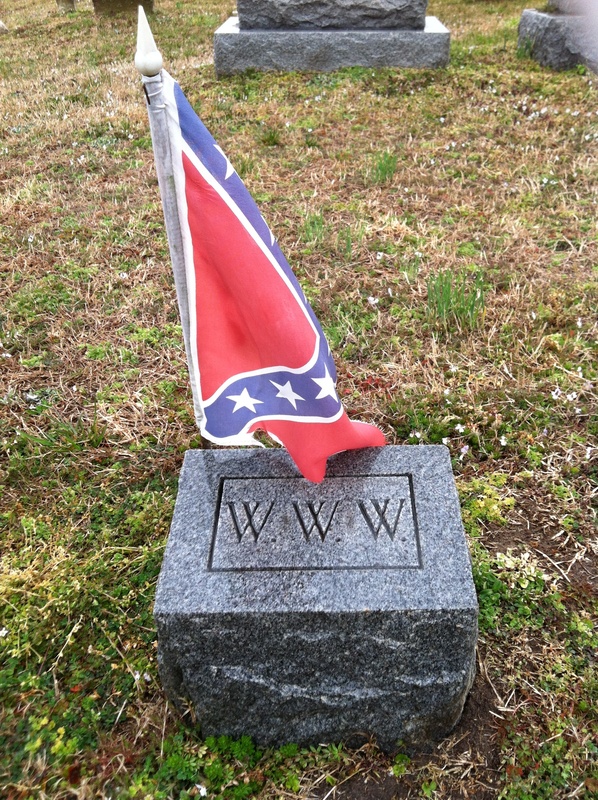 This flag – symbol of an oppressor that wanted the liberty to oppress some more – adorns a cemetery footstone just north of the VA-NC border. What does it say about Mr. W.W.W., his descendants or admirers? A few minutes later, we reached the border. Doug, who retired from the U.S. Navy after a long and distinguished career, has a much more nuanced view of the military than is expressed by the sign. And if money talks, the people of rich states, such as our state of New York, do a lot more for the military than poor North Carolina. But for what it’s worth, this was our welcome. 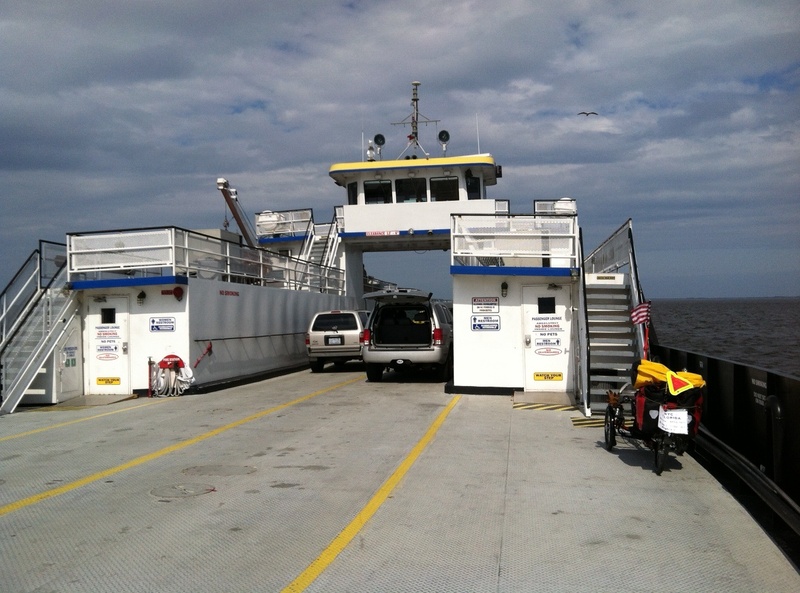 Then it was on through the rain to the Knotts Island – Currituck ferry. We had to wait 90 minutes for the next departure. The sun came out in time for the crossing, although it soon disappeared again. 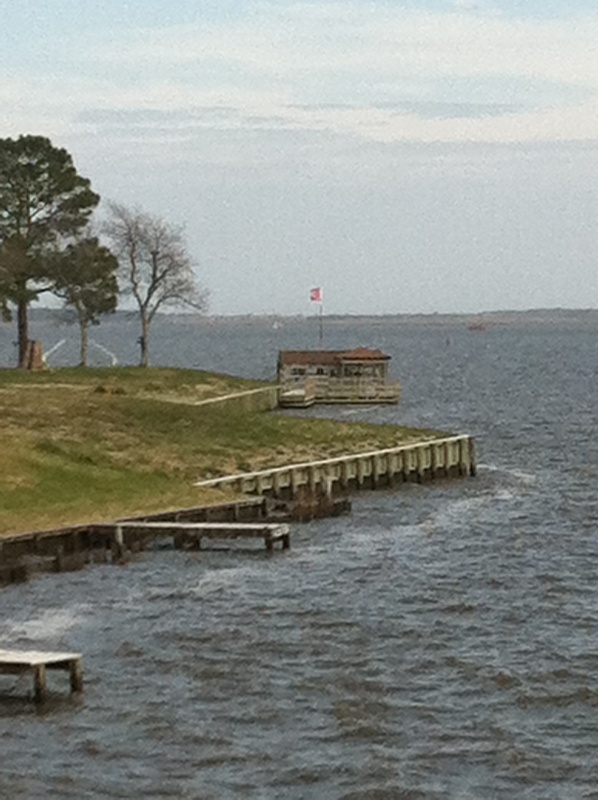 Note the Confederate flag flying from the private boathouse near the dock. We saw another just south of the NC line, but did not stop to photograph it. It flew from a trailer, and the only safe place to stop nearby was the trailer’s driveway – which may not have been safe either, if the flag means much to its owner. So we rolled on by. 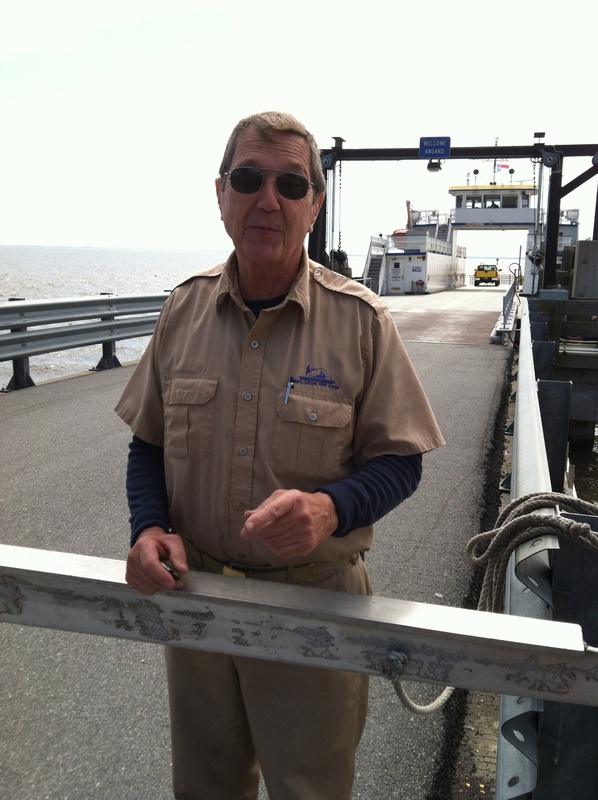 The high point of our 5-mile 45-minute ferry ride was our chat with Richard Henry Lee. Mr. Lee grew up in Richmond. 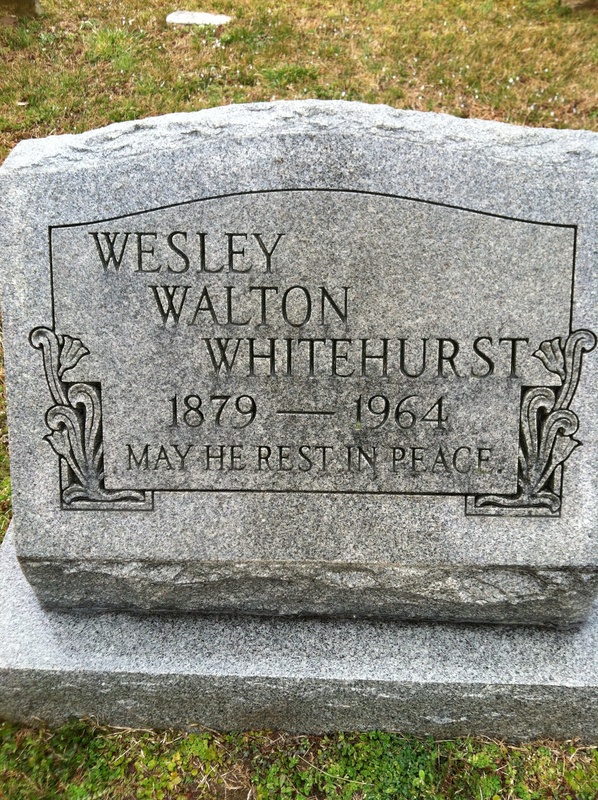 He may be related to the eponymous signer of the Declaration of Independence – Richmond’s records were burned at the end of the Civil War. Mr. Lee shares Jeffrey’s fascination with old machinery, the kind that ordinary mortals can understand and repair. He admires our courage in pedaling long distances; we admire his courage in motorcycling from NC to Key West, FL, to Point Barrow, Alaska, and home again, a distance of 14,000 miles. He and Jeffrey talked about lawyers, bureaucracy, and the kinship of cyclists and motorcyclists. He was very interested in the Ride, not only because he is a thoughtful man, but because (perhaps surprisingly in light of his old-time musical Southern accent) his mother’s people were refugees from Mussolini’s fascist Italy. The ferry was almost empty, but the passengers were cosmopolitan. One of them used to be on the support staff of Weil, Gotshal & Manges, the law firm where Jeffrey started his career. Small world! But big enough for everyone. 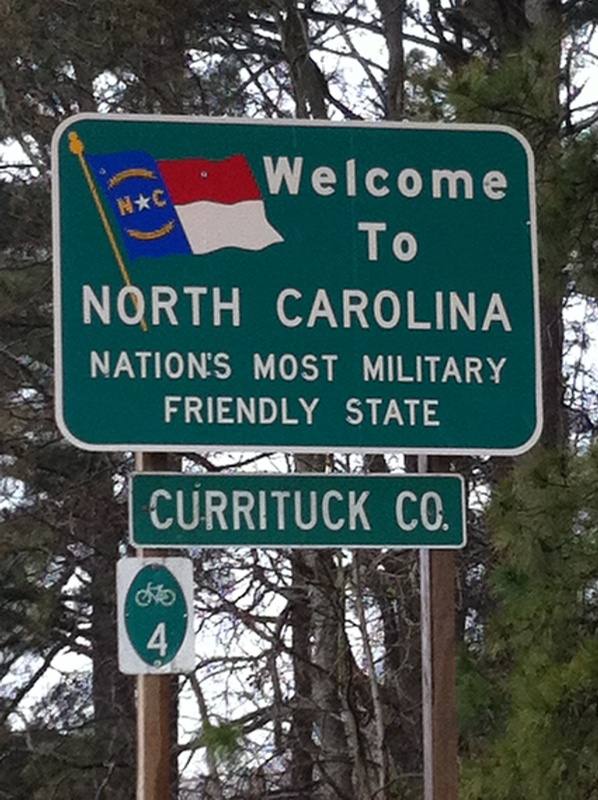 We landed in Currituck and headed south for the Outer Banks. But we burned a lot of daylight during the long ferry wait. Rain started, thunderstorms were predicted, and we would arrive at Kitty Hawk after dark. So we found Barry’s Walnut Island Lodge in Grandy and called it a day. 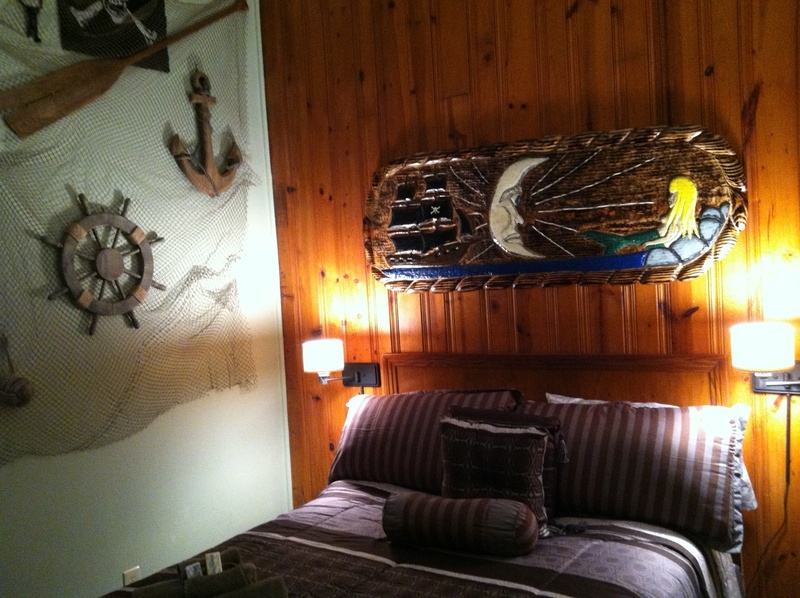 Barry gave us a discount and we are the first to stay in the newly decorated Pirate Room! This entry was posted in Bicycle Touring, Confederate flag, Freedom, Human Rights, Passover, Richard Henry Lee by Joey. Bookmark the permalink. I hope “easter Monday” or aka Passover Day 7 takes you nicely into South Carolina. I imagine you realize the Confederate Flag may show up more often there. 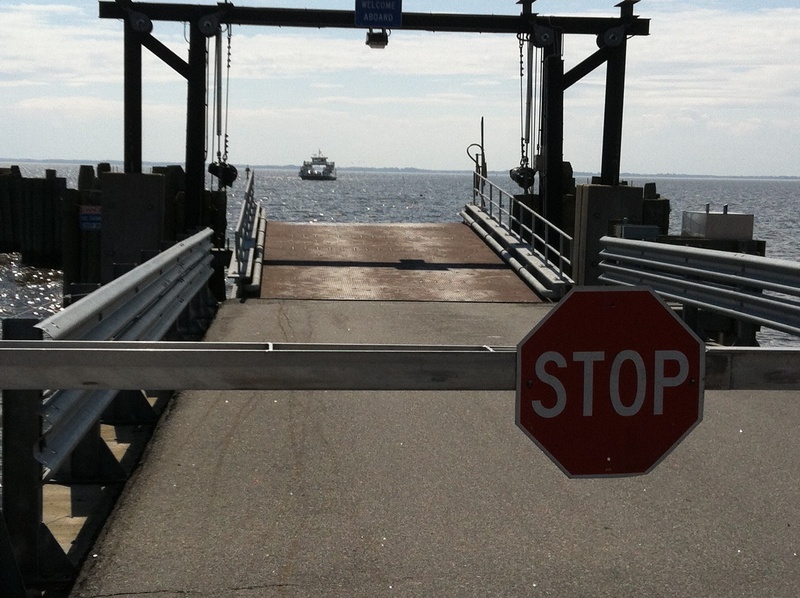 I guess your ferry rides may be over for the rest of the trip. You really are covering those miles at a good pace it seems. Your Uncle Morris would be happy that you are spending the night in Kitty Hawk. Today, I saw a dead deer with turkey vulture hovering over it, and I thought of you. Be safe!